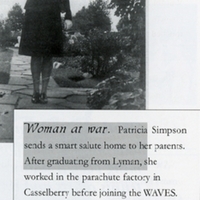 Lyman High School alumna Patricia Simpson. 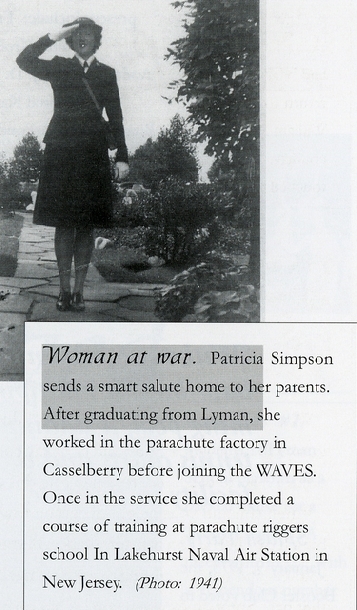 After graduating from Lyman, Simpson began working in a parachute factory in Casselberry, Florida. Shortly afterward, she joined Women Accepted for Volunteer Emergency Service (WAVES), completing a training course in parachute rigging at Lakehurst Naval Air Station in Jackson, New Jersey. Although the photograph is dated as 1941, it was likely taken sometime after 1942, as WAVES did not exist in that year. WAVES, officially named the U.S. Naval Reserve (Women's Reserve), was established on July 30, 1942, as a division in the United States Navy for women. WAVES was officially part of the Navy and its members held thee same rank and ratings as their male counterparts, received the same pay, and were subject to the same standards for military discipline. Initially, WAVES members were stationed only in the continental U.S. and were barred from serving aboard combat ships or aircraft. Towards the end of World War II, members of WAVES were allowed to serve in a number of U.S. occupied locations, such as Hawaii. Most members of WAVES performed clerical work, but a number served in aviation, medicine, communications, intelligence, storekeeping, science, and technology. On June 12, 1948, women were granted permanent status in the Armed Forces via the Women's Armed Services Integration Act. The V9 WAVE Officer Candidate Volunteer Program and V10 WAVE Enlisted Rating Volunteer Program were discontinued and renamed the W9 Women's Officer Training Program and W10 Women's Enlisted Training Program, respecitvely, because women were no longer volunteers as the WAVES acronym implied. Nonetheless, the acronym for WAVES was still used through the 1970s. Print reproduction of original black and white photograph: Greyhound 1999, (Longwood, FL: Lyman High School, 1999): Seminole County Public Schools Collection, UCF Public History Center, Sanford, Florida. Chen, C. Peter. "WAVES: Women in the WW2 US Navy." World War II Database. http://ww2db.com/other.php?other_id=24. "Facts about the WAVES." Women's Reserve of the US Naval Reserve (WAVES). http://www.blitzkriegbaby.de/waves/waves2.htm. Collins, Winifred Quick, and Herbert M. Levine. More Than a Uniform: A Navy Woman in a Navy Man's World. Denton, Tex: University of North Texas Press, 1997. Ebbert, Jean, and Marie-Beth Hall. Crossed Currents: Navy Women from WWI to Tailhook. Washington: Brassey's (US), 1993. Holm, Jeanne. Women in the Military: An Unfinished Revolution. Novato, CA: Presidio Press, 1982. "World War II era WAVES Overview and Special Image Selection." Naval History & Heritage Command. http://www.ibiblio.org/hyperwar/OnlineLibrary/photos/prs-tpic/females/wave-ww2.htm. Greyhound Staff of 1999. “Woman at War.” RICHES of Central Florida accessed April 25, 2019, https://richesmi.cah.ucf.edu/omeka/items/show/2817.